I have been baking quite a few of Jo Wheatley’s recipes from her book “A Passion For Baking” recently. I have found all of her recipes to be straightforward for both beginners and more experienced bakers. Every single recipe I have tried from her book, I want to bake over and over again. The same goes for the scrumptious Apricot Loaf as featured on page 72 of the book. I love the introduction that Jo gives to every recipe and this recipe was a variation on her Auntie’s Sultana Loaf cake. Before half term I was working four and a half days a week in my day job and that didn’t leave much time for baking for pleasure that my family could enjoy. The last week leading up to half term week was one of those weeks where I felt I was meeting myself coming backwards. It got to the Wednesday and I couldn’t remember what I had done before. I had got in from work and my son was complaining he was hungry and there was nothing for him to eat. There was: fruit! The very word fruit sends shivers down my son’s spine even though he used to eat loads as a young child. As soon as he reached high school its as if fruit is not “cool” or “in”! So, I decided that I would bake a loaf cake that my children could have a slice of to stave off the hunger until tea time. We usually eat our dinner late now as we have a horse that needs feeding and putting away, so dinner isn’t usually til 7.30pm in our house. I looked through Jo’s book to find a suitable loaf cake and spotted the Apricot Loaf cake. Glancing at the ingredients I was pleased to see I had enough dried apricots left. It also needed almond essence (I use a fab almond extract you can buy in Lakeland, a little goes a long way and it makes all cakes taste wonderful). First the dried apricots had to be chopped up and soaked in boiling water for about 10 minutes. I then rinsed off the water and patted them dry. I then added some sugar, butter and the almond extract to the bowl, followed by some eggs and finally the flour was folded in carefully. Finally, it was ready to go in the loaf tin. I use Lakeland’s loaf tin liners which are really useful as I make a lot of loaf cakes. 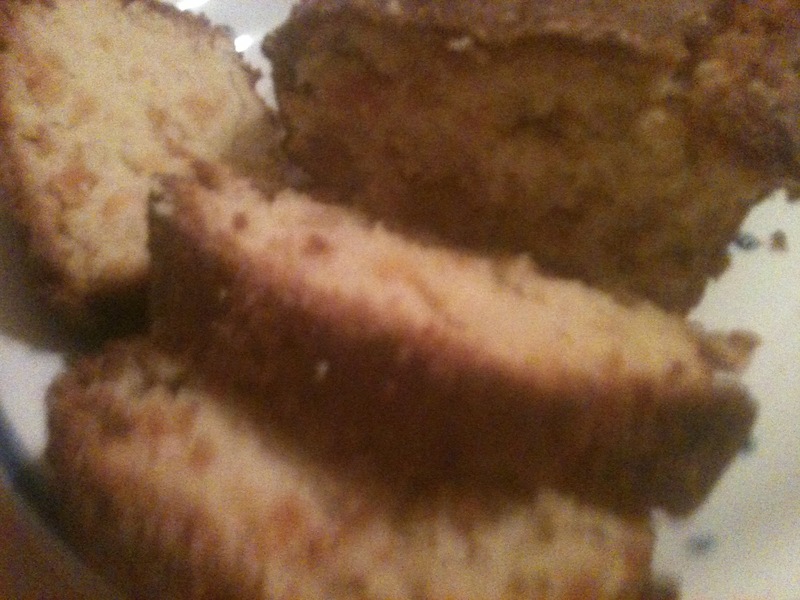 I loved the idea of sprinkling some demerara sugar on top of the loaf cake to add a little crunch. The cake baked in the oven for just over an hour, which gave me time to give my dog a walk before dark. When I got back the aroma of almonds was absolutely mouthwatering. I couldn’t wait to eat a piece now! Not a very good photo, had to use my phone to take the picture! At long last I removed the cake from the oven and left it to cool on my rack. I told my children they were welcome to a slice of Apricot Cake and was greeted with “Ugh, I don’t like Apricots!” I was gutted! They used to like dried apricots, I should have kept my mouth shut and called it “Fruit Loaf”. Well, all the more for me, I suppose! Funnily enough my daughter and husband did try some and loved it, so it just goes to show. Well, I know this is going to be a firm favourite for me and I can see it getting baked over and over again in the future.